^ Gray, Richard J.; Robinson, Owen (April 15, 2008). A companion to the literature and culture of the American south. John Wiley & Sons. ISBN 978-0470756690. (Subscription required (help)). ^ "The real king of delta blues - Tommy Johnson". Erinharpe.com. Retrieved 24 August 2016. ^ "Blues Singers". University of Virginia. Retrieved 24 August 2016. ^ Ciment, Michel; Niogret, Hubert (1998). The Logic of Soft Drugs. Positif. Positive. (Subscription required (help)). ^ Molvar, Kari (March–April 2001). ""Q&A: Tim Blake Nelson"". Brown Alumni Magazine. Archived from the original on December 26, 2001. Retrieved December 26, 2001. ^ a b c d Sharf, Zach. 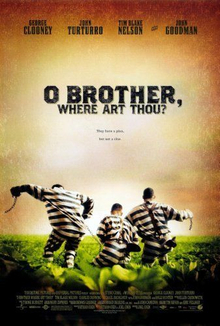 "The Coen Brothers and George Clooney Uncover the Magic of 'O Brother, Where Art Thou?' at 15th Anniversary Reunion". IndieWire. Retrieved 19 November 2015.